Despite not being much of a Hemingway fan, I find this letter provides a fascinating glimpse into a writer’s creative process. 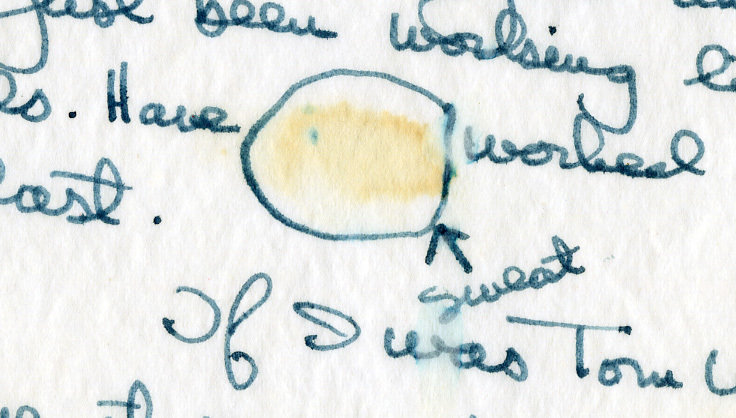 The last paragraph of text and the physical evidence of his sweat on the paper – highlighted by the author himself – tell the same story. I like to imagine the bearded, shirtless Hemingway in the early morning Cuban sun, struggling to bring his thoughts to paper before they are rinsed away by the sweat of his brow.